A multi-million dollar transparent roof canopy providing shelter from the elements is the first in a series of upgrades set to begin at Harbour Town Melbourne. 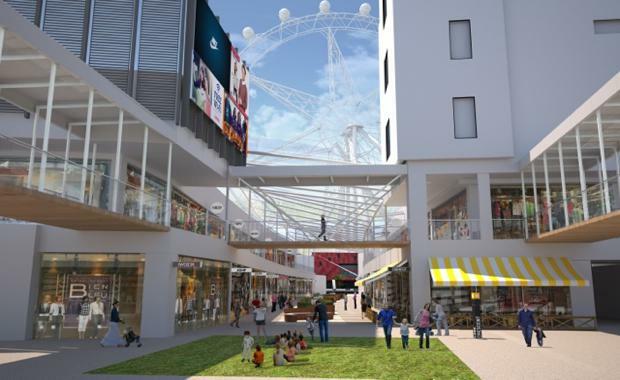 In addition to the expansive roof canopy that will cover Star Crescent and Wharf Street, the mall facades and shopping amenities will also be redeveloped. Red Design Group is the agency behind the Centre's upgrade. “We based our concept for the centre around the proposition that Harbour Town Melbourne was already unique in its outdoor living environment,” said Red Design Group Creative Director Colin Bell. As part of the overhaul, customer pathways around the centre will be improved and a number of under utilised pedestrian bridges and escalators removed, which will allow for the creation of two major plazas that will serve as event spaces and interaction hubs. The unique canopy that will provide shelter to the centre was conceptualised by global design firm, The Buchan Group. “The overriding design imperative for the canopy project is to touch as lightly and unobtrusively as possible on the ‘open’ sense of the existing centre, ” said Buchan Group Design Principal Joe Genovesi. Harbour Town owner Ashemorgan is set to undertake "significant capital investment" in the Centre in the years ahead, according to Ashemorgan Principal Alton Abrahams. This looks to be only the first of many initiatives to revamp Harbour Town Melbourne. AsheMorgan's Principle Alton Anrhams expects the substantial capital investment into the multi-phased masterplan will reinvigorate the precinct. AsheMorgan hold a number of assets within the city of Melbourne's Tourism destination including Harbour Town Melbourne (40,818sqm of GLA), the Medibank Ice House, the retail center itself and a number of other development sites which have been earmarked for development within the masterplan. SC Capital Partners which is a Singapore-based firm purchased half of the $146 million Harbour Town portfolio and look to be working closely with Ashe Morgan to reposition the assets. The project will be held within the firms fourth private equity fund, Real Estate Capital Asia Partners IV (RECAP IV). The fund looks to target markets that will benifit from the assumed continuation of outbound Chinese tourism, like the Darwin resort the fund purchased at the end of 2014. RECAP IV is supported by 34 global institutions who sit on collective stack of around $US1.7 billion ($2.18bn) to $US2bn.